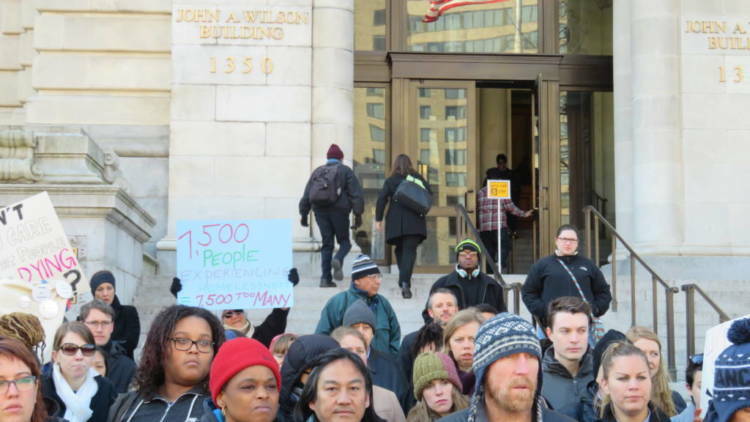 Mayor Muriel Bowser released her 14.5-billion-dollar budget proposal, entitled “A Fair Shot,” for the fiscal year 2019 on March 21. The proposed budget allocates the highest funding levels in the District’s history for homeless services as well as a modest increase in funding for affordable housing initiatives, in line with the Mayor’s mission to make homelessness “rare, brief, and nonrecurring.” This budget proposal is an increase from that of fiscal year 2018, but it has received some criticism from the D.C. Fiscal Policy Institute and the Washington Legal Clinic for the Homeless, among others, for not allocating enough funding for D.C.’s lowest income residents. Critics say the proposed budget does not meet the needs of District residents who earn below 30 percent of the area median income, or $32,600 for a family of four. 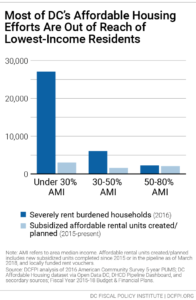 There are 43,000 renter households in D.C. that earn 30 percent or less of the AMI, of whom 26,000 are severely rent burdened and in need of affordable housing. The proposal would allocate $100 million to The Housing Production Trust Fund, a fund used to build and preserve affordable housing throughout the city. However it fails to dedicate the HPTF’s statutory minimum 40 percent share of funding to the District’s lowest income residents. Since 2014, the Fund has met the minimum requirement only once. “The budget does not make much progress in expanding assistance to D.C.’s extremely low-income families, who face the most severe affordable housing challenges,” said Claire Zippel, a policy analyst at the D.C. Fiscal Policy Institute, in a report on the proposed budget’s allocation for affordable housing. Laura Zeilinger, Director of the Department of Human Services, outlined the budget proposal’s five main areas of support to the DHS. The budget focuses on reforming the system of care for families experiencing homelessness by launching new short-term family housing and supporting exits from shelters with Rapid Rehousing. It aims to enhance crisis response and connections to housing for individuals experiencing homelessness by expanding daytime services, improving shelter operations, and launching new homelessness prevention services. It also focuses on expanding services for youth and their families, supporting families who receive Temporary Assistance for Needy Families, or TANF, and improving customer service at service centers by opening earlier and increasing staff. In an 18 percent increase from last year, the proposed budget adds $2.3 million to assist formerly homeless residents. This would increase funding for Targeted Affordable Housing, which helps formerly homeless residents– approximately 100 families and 70 individuals– who no longer need the comprehensive services of Permanent Supportive Housing but still need help affording housing. Funding for the Home Purchase Assistance Act and the Employer Assisted Housing Program, which help fund down-payment assistance for moderate- and low-income first-time home buyers, would increase by 50 percent after accounting for inflation. 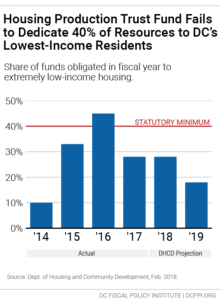 Where the budget fails to help D.C.’s lowest income residents gain housing is in its lack of funding and assistance through the Local Rent Supplement Program, according to a report by Kate Coventry of the D.C. Fiscal Policy Institute. LRSP was created in 2007 to help extremely low-income residents access decent housing that they can afford. The proposed budget for LRSP, at $29.3 million, is a 2.2 percent reduction from last year’s budget. “Unless the LRSP is scaled up beyond the level provided in the proposed FY 2019 budget, or the District pursues new strategies to finance affordable housing, the District’s other affordable housing tools will continue to fail to reach extremely low-income residents in a meaningful way,” Zippel said. No new funds for vouchers to help families on the D.C. Housing Authority waiting list are included in the proposed budget. These vouchers help families on the waiting list pay rent in privately owned housing throughout the city. The proposal also calls for a substantial restructuring of the shelter system for single people. The budget proposal includes funding to replace the 801 East Men’s Shelter with a new facility on the campus of St. Elizabeths hospital, as well as funding to close the Harriet Tubman Emergency Shelter for Women, near the D.C. General family shelter. There are also plans to renovate Blair House, the New York Avenue low-barrier men’s shelter, and the Emery Work Bed Program. While the proposed fiscal year 2019 budget provides the highest-ever funding level for homeless services, some say it does not meet the needs outlined in the Interagency Council on Homelessness’ Strategic Plan. The plan, a 2015 campaign promise of Mayor Bowser, vowed to make homelessness in the District rare, brief, and non-recurring by the year 2020.